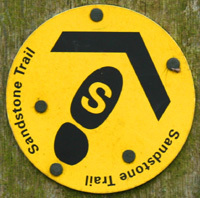 We’re relaunching the much loved Sandstone Trail Challenge for 2011. A formidable challenge for runners and walkers alike, this event has a long history of involvement from Helsby RC and we’re relaunching it as an LDWA event for the current year. Not just for runners! We’re a running club, but this an event for walkers and runners. Indeed half the places will be reserved for walkers, so there’s no danger of them being outnumbered. There’s an interesting round-up from Andy Robinson here. Find out more on the Helsby website. Any questions, ask at the club or email andy@crewood.net. See you on May 21! Be warned, it’s likely to sell out, we’re already half full, primarily from word of mouth. This entry was posted in Uncategorized and tagged beeston castle, challenge, delamere, fire service, frodsham, grindley brook, ldwa, sandstone trail. Bookmark the permalink. woooo can’t wait, i’m in!